What is the history of science a history of? The answer to this question is not as self evident as might appear. The answer that it is a history of “science” simply invites the further question: what is science? How are its boundaries to be demarcated? By whose authority are certain practices to be designated as “scientific?” Can the history of science be really independent of a philosophy of science, independent that is of assumptions about what science is? But is the philosophy of science itself a descriptive or normative enterprise? Does it simply reveal the assumptions that lie behind a certain kind of activity, or does it prescribe authoritative norms for that activity? What is the purpose of the history of science? Is it to describe the presence and growth of certain cognitive practices, or is it an attempt to explain them? If it is an explanatory enterprise, what would count as a successful explanation? Is scientific activity to be explained in terms of the unfolding of certain ideas? Is it to be explained by social causes? Is it to be explained by the diffusion of institutional forms? If these questions were not complicated enough, try adding another layer of puzzles. What would the history of a history of science be a history of? If “science” is a contested term, “history” is even more so. What is a proper historical narrative? Can history itself be written without some normative standpoint rooted in theories of progress? Why do the terms historians use like “nation” and so forth carry authoritative weight? Add to these questions the striking fact that often contests over the meaning of history and science take place in the context of relations of power. Colonialism for example used the lack of “science” as a sign of India’s backwardness; nationalists by contrast treated acquisition of a certain kind of science as a sign of modernity. The terrain of science was the terrain over which battles over the hierarchies of cultures and ways of life was fought. 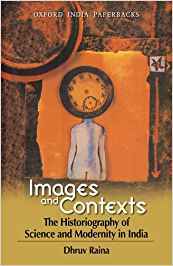 Images and Contexts, by the eminent historian and philosopher of science, Dhruv Raina, has the singular virtue of taking on all these complicated questions on board. The book collects nine of his essays, some previously published, and taken together they subtly tackle a wide range of questions relating to the historiography of science in India. The book is erudite and interesting and it is self conscious about the theoretical issues at stake almost to a fault. His own methodological approach is best described as an attempt to bridge the gap between sociologists of science on the one hand and the scientific community on the other. There is often a fear that sociology of science throws out the baby with the bath water. In its attempt to trace science to its social origins, the cognitive singularities of scientific practice often get obscured, and questions of validity are too swiftly assimilated to the play of social forces. Social epistemology on the other hand acknowledges the reciprocity between the scientific community and the sociologist of science; it draws upon the resources of history and social science to address some of the normative concerns of epistemologists. Most of the studies in this volume try and contextualize the normative concerns by locating them in a thicket of social and institutional settings. Occasionally there are glimpses of a more radical agenda at work: an attempt to dissolve the distinction between the cognitive and the social entirely, by arguing that scientific knowledge is conditioned and determined by the society around it. Although the introduction to the book is dense and packed with arguments that never quite fully spelled out, the essays are vignettes that shed light on complicated questions by using different lenses. There is an essay on P.C. Ray’s project on the history of chemistry and his scientific researches on mercury that shows how the assimilation of modern science was legitimized in modern India, and how Ray’s scientific practice neatly dovetailed with his conception of the history of science. Given the subject matter, an all too brief essay sensitively discusses the implications of the paradigm of the history of science bequeathed by Needham’s classic, Science and Civilization in China. A detailed study of the Indian Journal of the History of Science intelligently uses bibliometric analyses to argue that this journal was part of a project to legitimize science by emphasizing the antiquity of science in ancient India, but was also rooted in assumptions about what science is that were extremely conservative. The chapter also closely examines the political location of science in India, its connection with the nationalist movement, which itself is a product of global influences. One of the best essays in the book contains a subtle reading of a now forgotten debate between Ananda Coomaraswamy and George Sarton. Coomaraswamy had criticized George Sarton’s historiography of science for being rooted in presentist, postivist assumptions not just about science, but about the scope of human knowledge in general. This essay is must read for those interested not just in critiques of positivism in the early part of this century, but also for those interested in Commaraswamy’s thought. It skillfully blends biographical detail, historical context and a study of Commarswamy’s approach to the encounter between the East and the West to produce a finely textured account of the ambiguities and contradictions of his thinking. The opening essay, ‘Science and Romanticism’, is a wonderfully synoptic history of the critiques of science that have been produced within India since Independence and the relationship of these critiques to writing a history of science. This essay can serve as a good introduction to different debates over the cultural location and explanation of scientific activity in India. This essay, like much of the book, is dense with reference, though remarkably, they seldom strain the boundaries of intelligibility. The essays towards the end of the book discuss the implications of modernization and globalization for the historiography of science. Despite the methodological proclamations of the introduction, Dhruv Raina’s approach, in the end, to use his own phrase, is ecumenical, rather than driven by a single theory. Images and Contexts is marked by a genuine curiosity and excitement over the cultural and social making of science as a form of human activity; it is attentive to the complexity that attends to such an enterprise and refuses a will to simplification. Sometimes one wishes that Professor Raina had spelled out his own conception of the relation between the cognitive and the social more clearly, but that is perhaps the question for a next, more systematic project. Pratap Bhanu Mehta is Professor of Philosophy and of Law and Governance, Jawaharlal Nehru University. His most recent publication is The Burden of Democracy (Penguin).